Geothermal energy literally means - earth heat - or heat from the Earth. Energy is created from naturally occurring heat by either extracting hot water that circulates amongst rocks below the Earth’s surface or converting cold water into hot water by pumping it through very hot rocks. The heated water is brought to the surface and used to produce steam to drive turbines to produce electricity. Read more. 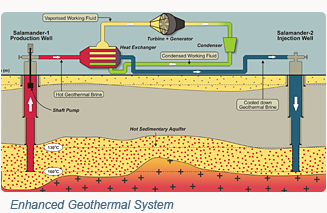 There are two main ways to extract heat from the Earth to generate geothermal power in Australia; Conventional Geothermal and Enhanced Geothermal. Read more.